After BriefMobile leaked what appear to be the first shots of a near-production-build of Android 4.2 running on a Samsung Nexus 10 tablet this morning, the response from many people has been absolutely vicious: the new UI looks like a giant phone, it doesn't look it's meant for a tablet, the pull-down notification bar doesn't make sense, the centered navigation buttons are going to be harder to reach, etc. I think, though, that this is reactionary. It's kind of what I expected, honestly. Not the reaction, but the look - because Google never really said whether or not they were keeping the old tablet UI, which inherently put its future in peril. I guess I sort of expected the reaction, too. Android fans have made a talking point of the fact that the iPad's UI is "just a giant iPhone" because of its inefficient use of screen real estate and near exact resemblance to iOS on the iPhone. And Google (indirectly) pulled that rug out from everyone today (or will, come Monday) with the Nexus 10 leak. Let's just look at it, side by side with the Nexus 7's portrait mode. First impression? It's a really fat Nexus 7. And I'm pretty sure that's all Google wants it to be. There are very good reasons for this. When Google unveiled the Nexus 7 and Jelly Bean at I/O earlier this year, the response of many enthusiasts to the new "tablet UI" on the smaller N7 was "uhh, this looks like a big phone." Even I, at first blush, wasn't too hot on the use of the notification bar. Then again, I didn't really know any better at the time. 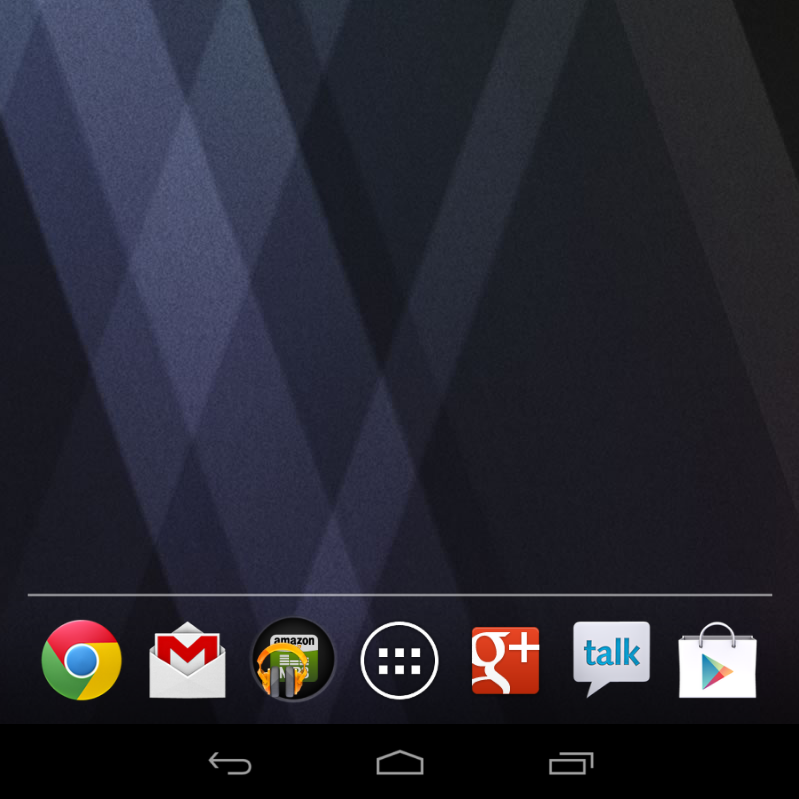 Having used my Nexus 7 for around 3 months now, I'm completely sold on this new layout. 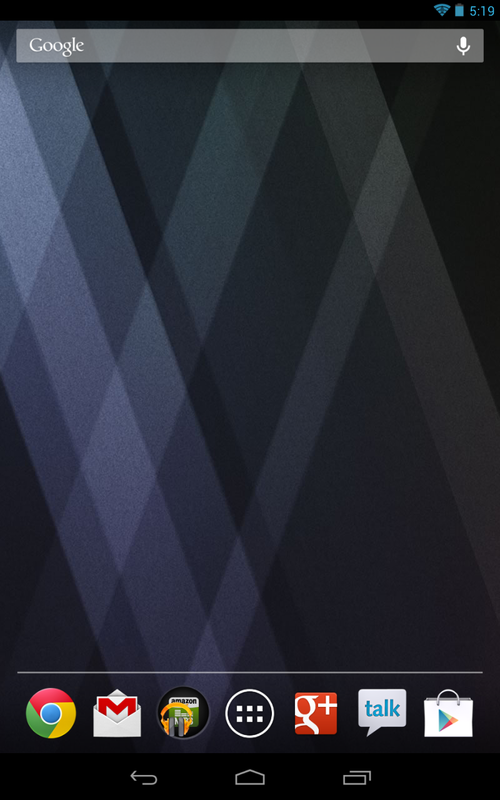 The notification bar is one of Android's greatest strengths. 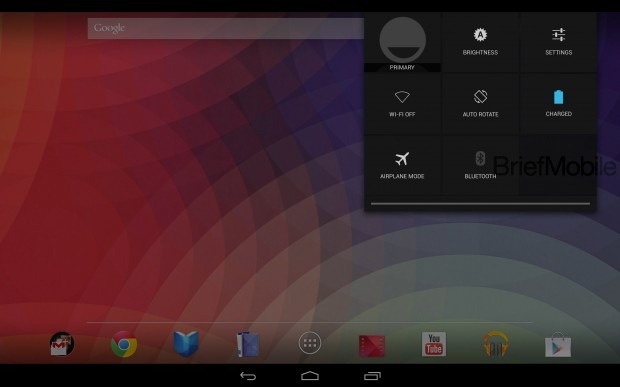 The control / notification panel of Honeycomb/ICS tablets was interesting, but it took away a defining feature of Android. 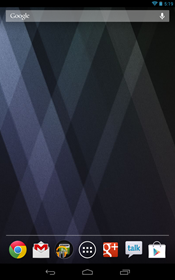 In the new large format landscape mode of Android 4.2, the notification tray has been pushed to the right edge of the display, for easier access. 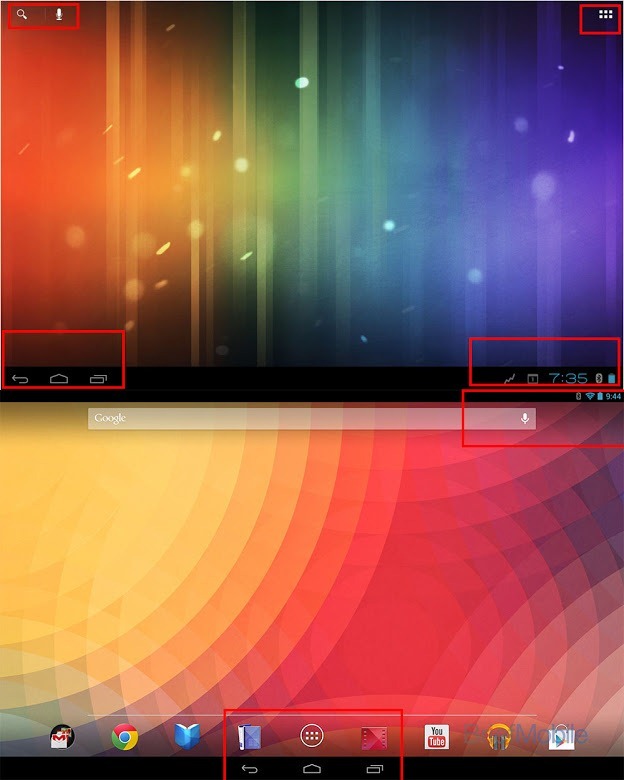 As Liam very correctly pointed out on Google+, what Google has done is taken the "four corners" approach of the Honeycomb / ICS tablet UI, stabbed it in a dark alley, and replaced it with the new tablet UI that has just two primary interaction areas: the top right, and the lower center. Again, credit to Liam for pointing this out. It's very clear what Google is doing - keeping users' attention on two general parts of the homescreen UI. The search / voice / notification area, and the app drawer / nav button area. Just like a modern Android phone. It makes sense - the experience across all [stock-ish] devices is now extremely consistent. Sort of like... Apple. Yep. Google is doing, in a way, what Apple did with the iPad: making it feel like a bigger version of a phone. And some people will hate that, but I think by and large, everyday consumers will appreciate it. 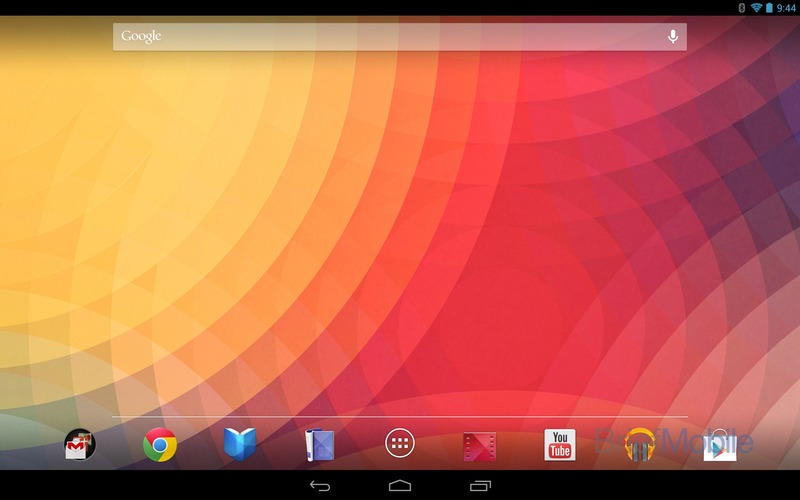 If you have an Android phone, going to this UI on an Android tablet will give you that "it just works" sort of feeling. At least more so than the previous UI did. And even if you do hate this new approach, in reality, that doesn't really matter. It's not the underlying UI of a tablet that's the biggest barrier to usability: it's the apps that are designed to work with it. Right now, Android is still lacking in that department. But by moving to a consistent UI across multiple hardware form factors, at least it's more likely normal consumers will be able to pick up an Android tablet and go, "Oh, I recognize this." And that's a good thing, even if you don't have your quick toggles and super-sized clock in the lower right-hand corner. Of course, if you really do want those things, XDA is just a click away, and I'm sure there will be plenty of community support for such features. But for everybody else, and Android at large, this probably is a good thing. Love it or hate it, this is the direction Google is taking Android, and I, for one, am happy to see them adopt this unified philosophy. So what if it doesn't feel "tablet optimized?" I'm using a tablet because I want to see more content than I do on my phone, largely doing the same activities I would there - not because I want "efficient use of homescreen real estate." So I say: you go, Google. Now, start bribing those developers to make tablet apps, because seriously, we need more of those.